I know I say it each and every time, but I love this quilt! You may recall that this one was inspired by the backing of my second time around quilt. I loved that abstract look, and decided to do another abstract design for the front of this quilt. What’s kind of fun about this type of quilt is that it doesn’t really take too much thought. 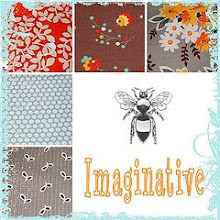 I didn’t spend any time selecting fabrics — instead I just used whatever was out – I grabbed pieces that were laying on the craft room floor, and other smaller pieces from my scrap bags. 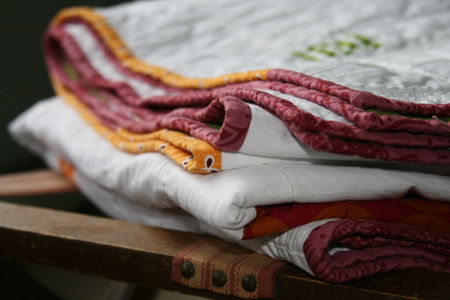 The quilting is nice and simple – just straight lines. I did horizontal lines in sections, 1/4″ apart. I did a section of about 4 or 5 lines, then skipped down a bit and did another section of a few lines (and repeated for the entire quilt!). There are also a few vertical lines, randomly spaced. This was the initial test of the GrandQuilter, and I can tell you that I’m quite happy with it! It was really nice to have the extra space to put a larger quilt through, and the speed of this machine made the quilting go by rather quickly. I’m a fan, yes indeed! 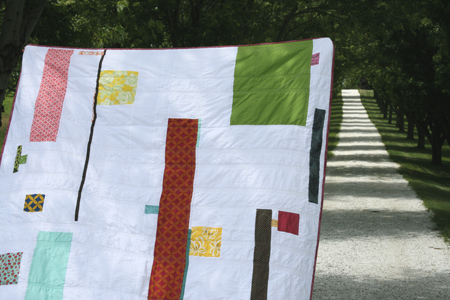 This entry was posted in [search] Wonky/Improv Quilts, 2009 Finished Quilts, Finished Quilts, Household Sewing - bags, napkins, pillows, Posts about Quilts, Quilts and tagged abstract, handmade, modern, quilt, quilting, scrap. Bookmark the permalink. oh love it! sometimes randomness & simplicity are a nice break from all the planned quilt patterns. great job! p.s. i think this quilt could be deemed reversible. the back is just as great as the front! I love it! 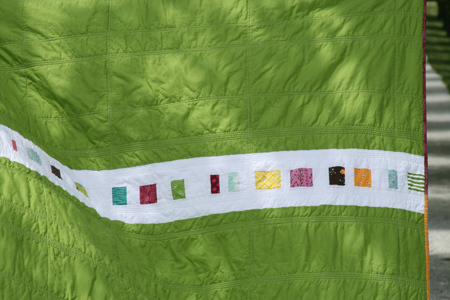 I have a favorite Kona green that I like to use a piece of in every quilt (almost) that I make. I agree with Heather that this one could indeed be reversible. It’s beautiful! I love how you used scraps, and that the back is just as nifty! i am so jealous that you are able to get so much more sewing done than me. i love all of your projects. thanks for sharing your creativity with us. Definitely reversible in my book! I love it too! really, you just grabbed what was lying around? really? it looks so good together! 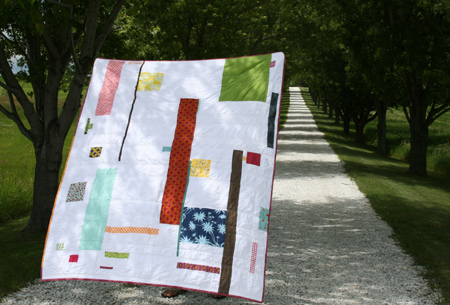 What a great quilt…that’s the best one I’ve seen in blogland in a month! Can’t decide if I like the back or the front better….I’m new to your blog and I’m so glad I’ve landed here! Love the abstract look of this. The quilting is great. You have an amazing output of quilts! Hey Ashley – do you have any problems piecing with that bleached muslin? I’ve been trying to work with it (along with some vintage sheets), and I keep getting the occasional skipped stitch and (more annoying) my machine sometimes tries to “eat” the fabric at the very beginning (pushing it down towards the bobbin where it gets bunched up). I tried switching to a “sharp” needle (80/12) and then a thinner sharp (70/10), and neither of those seemed to help much. Any advice? This looks nice. I really like it. There’s some fabric in there that I have and want to use more of it! :) LOVE the back also! :) GREAT job as usual. You inspire me! Awesome! I like your picture location 🙂 Good to see you this weekend! another beauty! hurray for a two sided quilt! both sides are extremely beautiful!!! Really lovely. I agree with Heather, this is reversible for sure! it’s absolutley beautiful!! i love the mod retro look of it!! This is so fabulous! I love the front, and I REALLY love the back, which would make a great quilt front too. Great colors. Oh it’s wonderful!! Love it. And you’re right about the green – it’s great. Beautiful quilt! I’ve been lurking awhile and I love to see all your lovely quilts. There are a lot of comments but, I have a silly question. 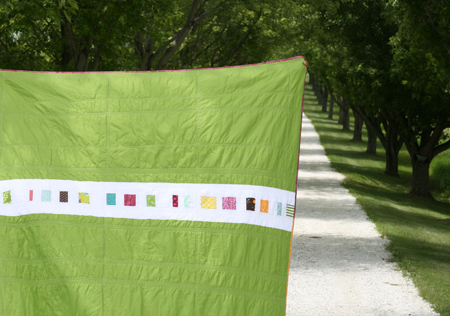 When you quilt in straight lines, do you use a walking foot? I have a Pfaff with built in dual feed and am unsure how well that would work. I am just now getting back into piecing but have never done any machine quilting. Thanks. ashley, your work inspires me. this is so beautiful! i love the abstract design. 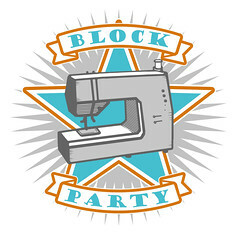 i have a question for you about doing large abstract patterns like this- do you piece the scraps with the white in big rows, or just applique them onto a solid white? one thing that i find hard to visualize in doing a large improv piece like this is how it all comes together in the end. thanks so much! Love it! Actually I love all your work. You inspire me, make me think out side the box. I have really enjoyed your quilts and this latest may be my favorite too. Maybe, I’ll have to see the next one. That kona is one of my favorites too. very pretty! congratulations! What do you do with all those quilts? Wow, what a great quilt. I love the back. That green is perfect. You inspire me to just pick up fabric and sew instead of drafting and planning. I love the randomness of it. It is a great quilt. How many quilts a week to you make? It seems like a ton 🙂 I am new to quilting and it takes me a while to make one. I’m totally in love with this quilt. I was just googling for inspiration and this caught my eye, now I’m drooling all over the place. I’m very much a novice quilter but I’m drawn to abstract designs (and I have a fairly decent eye). Do you think I could just start out with a quilt like this?! How do you piece it with the solid… do you just cut out rectangles and keep piecing until you have a top, then square it up?